<h2>Accelerators, fab labs and hackathons – the tech tools being co-opted for social good</h2><br /><p>Olivier Delarue is the CEO and co-founder of the Global Humanitarian Lab (GHL), which runs a project to revolutionise humanitarian operations using digital fabrication technologies — 3D printing, laser cutting, computer-controlled milling, vinyl cutting, casting and moulding — which can together create almost anything.</p> <p>He says that workshops known as fab labs (fabrication laboratories), which have become a staple of European innovation culture, can also be deployed in vulnerable communities to help them create custom or blueprinted aid infrastructure on the ground as they need it, flipping the top-down aid model.</p> <p>‘You can create your own affordable, customised electronic devices which are totally fit for purpose and based on your own challenges — or even create another fab lab, with machines making machines, enabling the democratisation of&nbsp;affordable digital fabrication,’ said Delarue.</p> <p> <div class="quote-view quotesBlock quote_horizontal"> <div class="quotesTop"><img src="https://horizon-magazine.eu/sites/all/themes/horizon/images/quotes_top.png" alt="" title="" /></div> <p>‘I think that, globally speaking, any stimulation that serves to help us do things differently is extremely welcome.’</p> <blockquote><p>Juan Luis Coderque Galligo, International Committee of the Red Cross, Switzerland</p></blockquote> <div class="quotesBottom"><img src="https://horizon-magazine.eu/sites/all/themes/horizon/images/quotes_bottom.png" alt="" title="" /></div> </div> </p> <p>He says that costs for 3D printing have dropped so drastically in the last few years that fabrication is now an affordable option in delivering aid and the technology is becoming more trusted.</p> <p>It can also equip people with skills for the future. The organisation’s first fab lab was created in Greece with Swiss organisation Terre des Hommes, engaging refugee minors who were normally just wandering through the streets of Ioannina.</p> <p>‘They are now going to a fab lab inside a community centre, and it’s a place where kids are able to learn by themselves, create by themselves and be responsible for their actions,’ said Delarue. ‘It gives them a foot in the 21st century and enables them to eventually have marketable skills in later life, or inspires them to become engineers or to employ their fabrication skills when they arrive in their country of refuge.’</p> <p><strong>Innovation tools</strong></p> <p>Fab labs are just one of a number of innovation tools most commonly associated with the tech sector which are now being used for humanitarian purposes.</p> <p>The UN World Food Programme (WFP) has set up an innovation accelerator based in Munich, Germany, focused on the agile testing of new aid solutions and the deployment of tools based on technologies like smartphones, big data and artificial intelligence.</p> <p><img class="@alignleft@" title="The UNWFP's Munich-based start-up accelerator helps deploy high-tech tools. 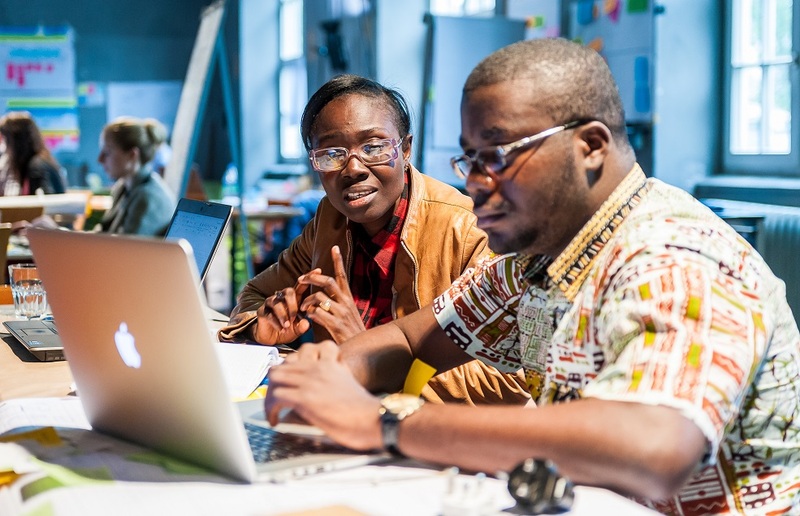 Credit — UNWFP-Malawi" src="https://horizon-magazine.eu/sites/default/files/WFP_Malawi_crop.jpg" alt="The UNWFP's Munich-based start-up accelerator helps deploy high-tech tools. Credit — UNWFP-Malawi" width="985" height="554" /></p> <p>The results are already playing out. Instead of just handing out cash or vouchers, some of the billion-plus euros of monetary food aid provided by the WFP every year is now supplied digitally.</p> <p>In Jordan, some of this aid is biometrically-linked, with refugees paying for food simply by looking into iris scanners, the money being deducted from identity-linked digital bank wallets — and a new WFP trial is using blockchain to lessen bank dependency, thus cutting fees and increasing transparency and accountability.</p> <p><strong>Competition</strong></p> <p>High-tech innovations such as these could become more common in the humanitarian sector thanks to a new competition that challenges people to find new ways of delivering aid.</p> <p>On 30 November, the EU’s European Innovation Council pilot launched a EUR 5 million Horizon prize to encourage people to come up with ideas that use advanced technologies to benefit humanitarian work.&nbsp;The money is split across different aid sectors like shelter, water and sanitation, energy, and health and medical care, and the aim is for people to use the concept of frugal innovation - the concept of doing more with less - to develop their ideas.</p> <p>Juan Luis Coderque Galligo from the International Committee of the Red Cross (ICRC), says that such prizes could help inspire the kind of new thinking needed to bring about humanitarian change.</p> <p>‘I think that, globally speaking, any stimulation that serves to help us do things differently is extremely welcome. Being encouraged to become more agile, to be more innovative, and to adapt is always most welcome and much needed.’</p> <p>Coderque Galligo, who founded and heads the ICRC’s corporate partnerships unit, says the ICRC already embraces frugal innovation, as well as partnerships with other organisations, to help serve amputees and other people with physical disabilities in conflict zones. The idea is to solve challenges in supplying affordable prosthetics.</p> <p>‘Two years ago we set up an agreement with the Swiss university EPFL (École Polytechnique Fédérale de Lausanne), launching the ICRC-EPFL humanitarian tech hub, which focuses on frugal innovation with development for low-income countries in mind,’ he said. ‘One of the things we have been working on with the EPFL is developing a new articulated foot for amputees.’</p> <p>He also points to the ICRC’s Enable Makeathon, a public hackathon that aims to crowdsource new solutions for disabled people over a three month period until January 2018. He says that including a range of different people and stakeholders helps everyone to think in different ways.</p> <p>‘In terms of the role that Europe can play, I think there continues to be a very important need for bringing actors from different sectors together, and it’s very difficult to think that institutions can innovate in a vacuum. We can’t.’</p> <p> <div class="moreInfoBlock"> <h3>EUR 5 million prize on affordable high-tech for humanitarian aid</h3> <p>On 30 November the EU laid down an open challenge for people to develop innovative solutions for the delivery of humanitarian aid based on frugal application of advanced technologies.</p> <p>The idea is to help maintain a humanitarian response in crises and disasters around the globe at a time when the aid sector is being challenged to do more for more people at greater cost.</p> <p>The EUR 5 million prize money is expected to be awarded in five prizes of EUR 1 million, divided between topics such as shelter, water, sanitation, energy, heating, cooling, food, hygiene and medical care.</p> <p>The deadline for applications is 15 January 2020 and anyone who wishes to apply can do so <a href="https://ec.europa.eu/research/eic/index.cfm?pg=prizes_aid" target="_blank" rel="noopener noreferrer">online</a>.</p> </div> </p> <p><a href="http://bit.ly/newsalertsignup" target="_blank" rel="noopener noreferrer"><img class="" src="https://horizon-magazine.eu/sites/default/files/news-alert-final.jpg" alt="" width="983" height="222" /></a></p> <p><em>If you liked this article, please consider sharing it on social media.</em></p> <br /> <img src=”http://www.google-analytics.com/collect?v=1&tid=UA-40077089-1&cid=accelerators-fab-labs-and-hackathons-–-the-tech-tools-being-co-opted-for-social-good&t=event&ec=republish&ea=read&el=accelerators-fab-labs-and-hackathons-–-the-tech-tools-being-co-opted-for-social-good&cs=republish&cm=republish&cn=republish&cm1=1" /> This post <a href="https://horizon-magazine.eu/article/accelerators-fab-labs-and-hackathons-tech-tools-being-co-opted-social-good.html">Accelerators, fab labs and hackathons – the tech tools being co-opted for social good</a> was originally published on <a href="https://horizon-magazine.eu/">Horizon: the EU Research &amp; Innovation magazine | European Commission</a>. Picture the humanitarian aid sector and you don’t immediately think of start-up accelerators and hackathons. But aid agencies are co-opting these tools of innovation to help solve global issues – and a new EUR 5 million prize from the EU is designed to boost this even further. Olivier Delarue is the CEO and co-founder of the Global Humanitarian Lab (GHL), which runs a project to revolutionise humanitarian operations using digital fabrication technologies — 3D printing, laser cutting, computer-controlled milling, vinyl cutting, casting and moulding — which can together create almost anything. He says that workshops known as fab labs (fabrication laboratories), which have become a staple of European innovation culture, can also be deployed in vulnerable communities to help them create custom or blueprinted aid infrastructure on the ground as they need it, flipping the top-down aid model. ‘You can create your own affordable, customised electronic devices which are totally fit for purpose and based on your own challenges — or even create another fab lab, with machines making machines, enabling the democratisation of affordable digital fabrication,’ said Delarue. He says that costs for 3D printing have dropped so drastically in the last few years that fabrication is now an affordable option in delivering aid and the technology is becoming more trusted. It can also equip people with skills for the future. The organisation’s first fab lab was created in Greece with Swiss organisation Terre des Hommes, engaging refugee minors who were normally just wandering through the streets of Ioannina. Fab labs are just one of a number of innovation tools most commonly associated with the tech sector which are now being used for humanitarian purposes. The UN World Food Programme (WFP) has set up an innovation accelerator based in Munich, Germany, focused on the agile testing of new aid solutions and the deployment of tools based on technologies like smartphones, big data and artificial intelligence. The results are already playing out. Instead of just handing out cash or vouchers, some of the billion-plus euros of monetary food aid provided by the WFP every year is now supplied digitally. In Jordan, some of this aid is biometrically-linked, with refugees paying for food simply by looking into iris scanners, the money being deducted from identity-linked digital bank wallets — and a new WFP trial is using blockchain to lessen bank dependency, thus cutting fees and increasing transparency and accountability. High-tech innovations such as these could become more common in the humanitarian sector thanks to a new competition that challenges people to find new ways of delivering aid. On 30 November, the EU’s European Innovation Council pilot launched a EUR 5 million Horizon prize to encourage people to come up with ideas that use advanced technologies to benefit humanitarian work. The money is split across different aid sectors like shelter, water and sanitation, energy, and health and medical care, and the aim is for people to use the concept of frugal innovation - the concept of doing more with less - to develop their ideas. Juan Luis Coderque Galligo from the International Committee of the Red Cross (ICRC), says that such prizes could help inspire the kind of new thinking needed to bring about humanitarian change. Coderque Galligo, who founded and heads the ICRC’s corporate partnerships unit, says the ICRC already embraces frugal innovation, as well as partnerships with other organisations, to help serve amputees and other people with physical disabilities in conflict zones. The idea is to solve challenges in supplying affordable prosthetics. He also points to the ICRC’s Enable Makeathon, a public hackathon that aims to crowdsource new solutions for disabled people over a three month period until January 2018. He says that including a range of different people and stakeholders helps everyone to think in different ways. On 30 November the EU laid down an open challenge for people to develop innovative solutions for the delivery of humanitarian aid based on frugal application of advanced technologies. The idea is to help maintain a humanitarian response in crises and disasters around the globe at a time when the aid sector is being challenged to do more for more people at greater cost. The EUR 5 million prize money is expected to be awarded in five prizes of EUR 1 million, divided between topics such as shelter, water, sanitation, energy, heating, cooling, food, hygiene and medical care. The deadline for applications is 15 January 2020 and anyone who wishes to apply can do so online.